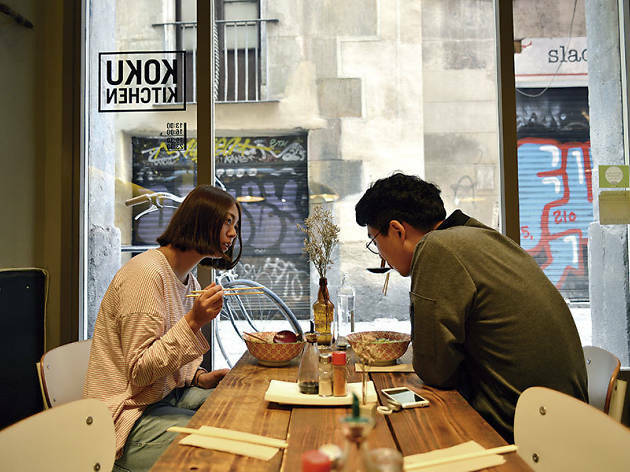 Koku Kitchen is one of Barcelona's veteran ramen bars. The owners are two Irishmen, Mark Liston and Ross O’Doherty, and the chef, Robert Johansson, is Swedish. 'We don't want to confuse people. We serve Japanese food, but we aren't Japanese,' they say. 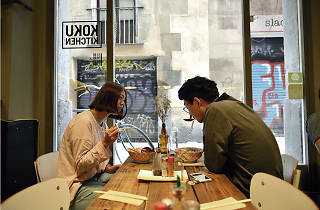 Don't worry, their excellent ramen is indisputably a Japanese recipe – the chef studied for a year at the renowned Oraga Noodles in Tokyo, and ensures that everything is home-made, except the marine algae of course. (Rice noodles are also available for those avoiding wheat.) Their Irish touch gives the place a pub feeling, and their dessert menu even includes banoffee (a combination of 'banana' and 'toffee', which must be tasted at least once in your life). To help you out, instructions are written on a chalkboard so you know just how to eat your ramen: 'Slurp loudly: don't be shy! If you love the soup, show your appreciation with an empty bowl.' 'I just got my entire face wet!' says a young woman next to us, laughing, as she puts the instructions into practice.